Western Bays Full Day package is without a doubt the best way to experience the spectacular scenery from the Great New Zealand Cycle Trail, and phenomenal views of the stunning Lake Taupo region by water. In one day, you will enjoy a 1 - 1.5 hour mountain-bike ride (this trail is suitable for less experienced or less fit riders), and easy 2 - 2.5 hours kayaking on the crystal clear waters of Lake Taupo. You will meet us at our base in Acacia Bay, where we will load your bike then set off by road to the Orakau section of the Great Lake Trail to begin our riding leg. We will start our ride from the Whangamata Road car park, the trail follows the Orakau Stream and Harakeke (flax) wetland, through regenerating native bush down to Kawakawa Bay on the edge of Lake Taupō. (Otherwise known in the region as Chinaman’s after Chinaman’s Creek by local riders). A great place to see a restoration project in place, as Bike Taupo, Greening Taupo and DOC work on the Wetland and Native Bush in this area. Trail Blurb: The trail starts by weaving in and out of pine trees and through gullies. There are a couple of boardwalks with excellent views of the Orakau wetland/stream valley with the pastureland visible on the nearby rural hillsides. With the lake and mountains out of view now the trail rolls in and out of bush and Harakeke (flax) wetland areas. Traversing the sides of this small valley the trail climbs to a wide bridge (without handrails) to cross over the stream. You will continue to descend through the Orakau Stream valley and through native regenerating bush till you reach a couple of bench seats from where there are stunning views of the volcanoes of Tongariro National Park just south of Lake Taupo. Once you’ve had a rest and taken in the view, the trail continues on under lush ponga tree fronds before crossing two bridges. feel stones under your tyre treads! The trail continues along parallel to the beach for a while before emerging onto the beach at the stunning Kawakawa Bay. 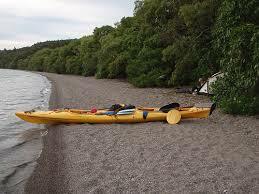 At Kawakawa Bay you will be meet by your kayak guide who load you bike on boat transporter. After a gourmet lunch stop in Kawakawa Bay, your guide will equip you, so we can set off on our kayaking journey around the western bays towards Kinloch. We will pass sheer tree-lined cliff faces that drop into the lake, and spectacular volcanic rocks/cliffs that emerge from the clear blue/green waters around the point into Whangamata Bay and the lakeside village of Kinloch. At Kinloch we will enjoy a a well-earned dinner of take-aways from the Kinloch Store (famous for their fantastic burgers), before returning to back to base by road. Note: Please refer to our Gear list tab on our website of what’s you need to bring and wear. Board a boat, and enjoy a complimentary glass of bubbly or beer while returning to Taupo via the world famous Māori Rock Carvings, or return by float plane, for the more adventurous.